Over the last decade or so it has become increasingly popular to make or put together your own Halloween costume from items you already have or can find cheap. As you can imagine, most costume companies are not big fans of this movement. Costume Holiday House, however, is more than happy to help you out with building your own costume. Why? Because having a great costume means having the complete look from head to toe and, to do that, you will need the right accessories! We have compiled a list of the most popular and important accessories that you may need this Halloween, including some things that you probably havenâ€™t thought about! Many people say that the hat makes the outfit, and we couldnâ€™t agree more! Our stores have large sections dedicated to just hats. We have bowlers, top hats, fedoras, police hats, chef hats, witch hats, tricorns, bicorns, stetsons, sombreros, the list goes on and on! Suffice it to say that we have just about any hat you could want. We also carry a variety of helmets, headbands, miniature hats, crowns, and tiaras! There are many characters that require specific types of hair; you canâ€™t be Captain Jack Sparrow without the dreadlocks, moustache and goatee. Not only can the right hair make your costume easily recognizable, it is also the easiest way to change your appearance. Maybe you just want to look different this Halloween. One of our wigs might be the best way to go! We have wigs in a wide range of styles and qualities so, whether your looking for a cheap wig or something on the higher end, we will have a wig for you! Another really easy way to alter your appearance is with eyewear. We all know how different Superman looks when he wears his black wayfarer glasses! We have glasses and sunglasses for almost every time period, ranging from tip-of-the-nose rectangle glasses for Santa Claus to disco ball sunglasses for Elton John. We also carry false eyelashes for a more subtle change. The great thing about our makeup is that it is the best quality. Our makeup is made by companies such as Ben Nye, Mehron and Graftobian. These companies are known in the theatrical world for their high quality makeup that works and lasts. Many of our competitors carry makeup from no-name brands and, while they may be a little cheaper, you get what you pay for. We also have makeup experts in our stores who can help you find the right makeup based on what youâ€™re trying to do and how much you want to spend. Not only can a cape add a lot of character to your costume, it can keep you warm! If youâ€™re attending an outdoor party or dressing up for a haunted hayride, you may want a cape to keep you warm while staying in character. If youâ€™re planning to be a Superhero, Vampire or any kind of royalty this Halloween, you will definitely require a cape. We have capes in many styles and lengths; we even have capes made specifically to fit children! You may be surprised to hear that Halloween jewelry is not just for women! There are many popular male costumes that require jewelry and you would be surprised by how much of a difference it can make. We have jewelry for pirates, pimps, and rock stars, to name a few. For the ladies, we have a variety of costume jewelry to spice up period costumes. We also have some off-the-wall jewelry, like bone necklaces for cave people or clock & gear jewelry for Steampunk costumes. Gloves may seem like an insignificant part of a costume, but they actually add a lot of authenticity to a look.Â A pair of white gloves can be the difference between trying to look like a Ringmaster and looking like a Ringmaster. A pair of long gloves will add flair to a Flapper or a Saloon Girl. Lace gloves can be the finishing touch to an 80â€™s costume or a Southern Belle. Never underestimate the power of a glove (just look at Michael Jackson)! Tights are another accessory that is often forgotten. Every year, without fail, we get last-minute shoppers who come in the night of their party just to get a pair of tights. 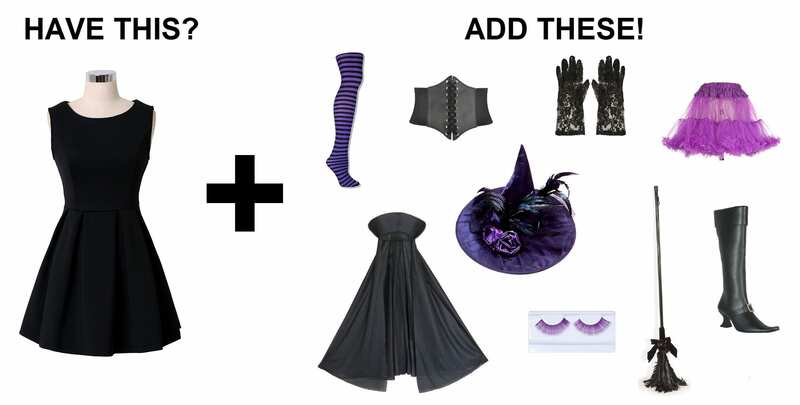 Like a cape, tights can help to keep you warm, and like gloves, they can really spice up your costume! Another advantage of wearing tights is that they can add a level of modesty to your outfit. Our sexier costumes are very cute, but they can also be quite short. A pair of opaque tights might make you feel more comfortable, especially at a crowded party. What is a costume without the right props? While we carry a variety of props, our most popular props are weapons (fake ones, of course). We have grappling hooks for Batman, nunchucks for Ninja Turtles, light sabers for Jedi, holsters & revolvers for Cowboys,Â machine guns for Gangsters, and so on. If itâ€™s a weapon, we probably have it!